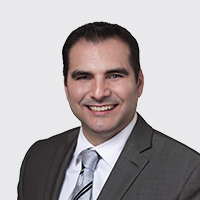 S. Isaac Escobedo has been practicing law since 2003. He began his career as a District Attorney in Merced County where he gained invaluable litigation experience doing multiple court and jury trials. He was one of three attorneys in the General Felony Department which was usually reserved for attorneys with many more years of experience. Isaac has been practicing workers' compensation law since June 2009. He was voted into the partnership as an Associate Partner with Mullen & Filippi in 2014. Isaac received his law degree from Santa Clara University School of Law in 2003. He was a scholarship recipient all three years and was also a Summer Fellow at the East San Jose Community Law Center. He attended the University of California at Davis where he earned degrees in economics and religious studies. Isaac is a member of the State Bar of California in good standing. He is also a member of the Sacramento County Bar Association Workers' Compensation section. He is also on the Education Committee of the AWCP and has co-chaired conferences and seminars. What I both enjoy and dislike about workers' compensation law is that it is always changing. I am constantly learning and keeping up with all the new laws and regulations. This keeps me from stagnating as an attorney and from getting bored at work. People may be surprised to find out that I am a kid at heart. I love playing with my two young children and often watch cartoons with them. I also enjoy acting out scenes from Star Wars with my kids.